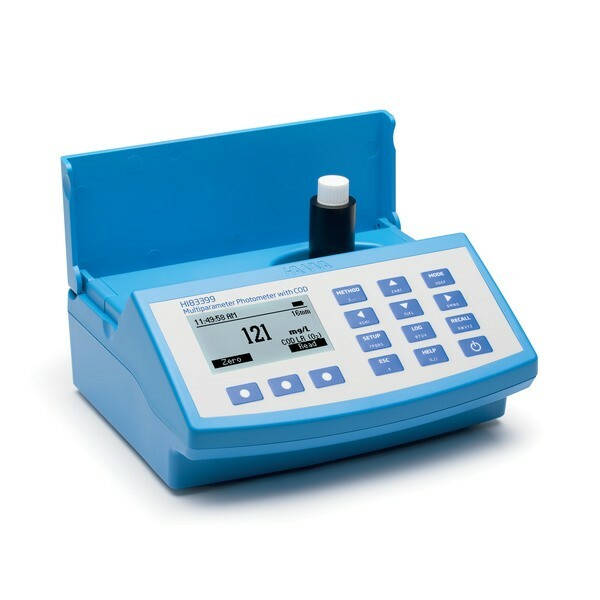 Product information "HI83399-02 | Water & Wastewater Multiparameter (with COD) Photometer and pH meter |"
HI83399 benchtop photometer measures 40 different key water and wastewater quality parameters using 73 different methods that allow for multiple ranges and variations in chemistry for specific applications. The Chemical Oxygen Demand (COD) parameter is included for industrial and municipal wastewater treatment. The Phosphorous and Nitrogen parameters included are beneficial to municipal wastewater treatment customers that need to monitor their biological and chemical nutrient removal process. This photometer features an innovative optical system that uses LEDS, narrow band interference filters, focusing lens and both a silicon photodetector for absorbance measurement and a reference detector to maintain a consistent light source ensures accurate and repeatable photometric readings every time. The HI83399 offers an absorbance measuring mode that allows for CAL Check standards to be used to validate the performance of the system. The absorbance mode allows the user to select one of the 5 wavelengths of light (420 nm, 466 nm, 525 nm, 575 nm, and 610 nm) to measure and plot their own concentration versus absorbance mode. This is useful for users with their own chemical method and for education to teach the concept of absorbance by using the Beer-Lambert Law. The HI83399 is supplied with a 16 mm cuvette adapter that accepts digestion vials. High Range: Adaptation of the vanadomolybdophosphoric acid method. HI83399 is supplied with sample cuvettes and caps (4 ea. ), cloth for wiping cuvettes, USB to micro USB cable connector, power adapter and instruction manual. Related links to "HI83399-02 | Water & Wastewater Multiparameter (with COD) Photometer and pH meter |"
Customer evaluation for "HI83399-02 | Water & Wastewater Multiparameter (with COD) Photometer and pH meter |"